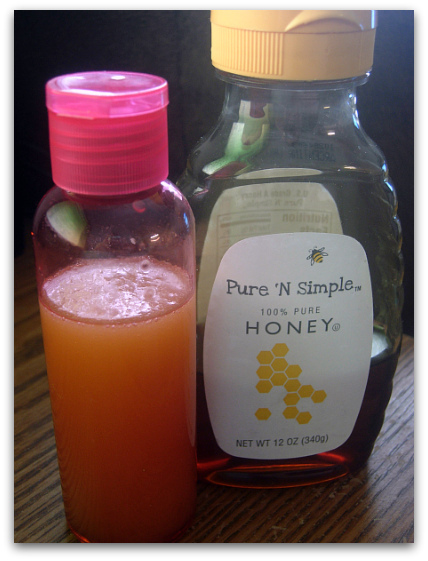 If your skin is feeling dry and is in the need of a little TLC I have a great recipe for you, courtesy of diyNatural. Lemon, honey and olive oil are mixed together to create a simple facial mask that you can use three times a week to refresh your skin. Note: I would recommend squeezing the juice from the lemon into a bowl. Strain any pulp or seeds from the juice. Measure the lemon juice using teaspoons or tablespoons. Then based on this measurement, add in the same amount of honey and olive oil to your lemon mixture. Place a small funnel over the top of your snap top bottle and pour the mixture in to your bottle. After the bottle is fully used up, clean the container well with soap. 1. Add equal parts fresh lemon juice, pure olive oil and honey to a clean snap top bottle. Shake to combine. The mixture will separate over time so shake well before using. To use: Pour about a quarter size amount of the mixture into your hand. Rub the mixture all over your face. Let sit for 10 minutes. Rinse the mixture off with warm water, using a clean wash cloth to gently massage it off. This is great- thank you! I've used a similar recipe, but I think this might be a magical formula. Can't wait to try it. What a brilliant idea...Nothing better than a natural way to have a great facial. Thanks for sharing. What a fantastic idea, love it! Your blog is cute, informative and extremely creative :) So glad to be your newest follower! I just made it, with some additions like vitamin E oil and some castor oil since I ran out of evoo. Do you know shelf life of it? I keep it in my honey beat bottle, so it's not a giant batch.